The only two bad things to come out of Barça’s fourth straight berth in the Copa del Rey final were a pair of second-half expulsions to Luis Suárez and Sergi Roberto, who saw two yellow cards each in Tuesday night’s tense, semi-final return leg against Atlético Madrid at Camp Nou. Both players, thus, will be suspended for the final, set for late May. Suárez’s expulsion was particularly surprising on Tuesday night, when the Uruguayan striker was cautioned on back-to-back plays in the 87th and 90th minutes. The second appeared to be incidental contact between Suárez and an Atlético player as both were going for a jump ball. 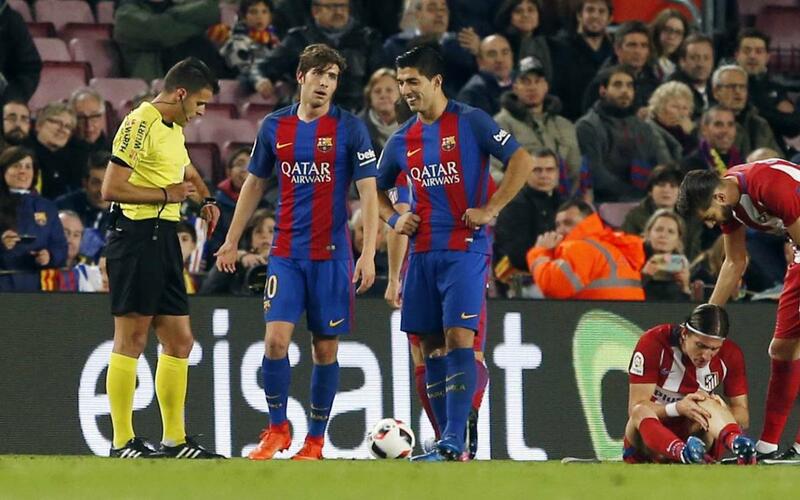 Suárez, in fact, only committed two fouls all game, but both were deemed worthy of yellow cards by the referee. Before being sent off, Suárez gave Barça a 1–0 lead just before halftime. It was Suárez’s fourth goal in six Cup games this season. Sergi Roberto had one yellow card in the first half and another in the 57th minute, spoiling his 25th birthday. It came just as he was about to be replaced by Aleix Vidal and forced Barça down to 10 men.